Renovation Coming at 40th & Spring Garden? For three years, we've covered various renovation and construction efforts surrounding 40th & Baring in West Philly, most recently visiting some new projects last week. 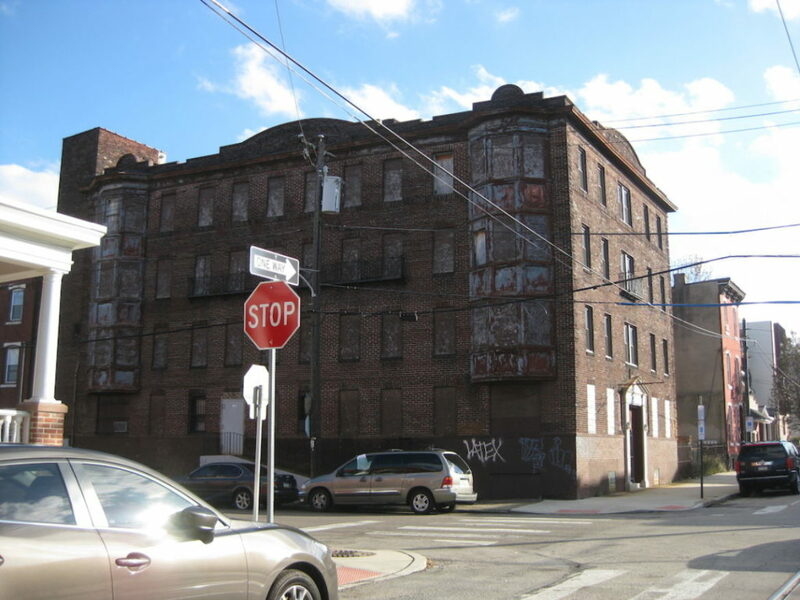 Every few months or so, a reader has checked in, wondering about 437 N. 40th St., an apparently vacant building on the southeast corner of 40th & Spring Garden. The four story structure has wonderful bones, but it has plywood for windows on its north side. Back in 2007, virtually all of the window openings were covered in plywood, so the building actually used to look worse. A sign out front indicates that the Greater Love Chapel once did business out of this building, but its present condition suggests that they're not there anymore. Notes from L&I over the last couple of years seem to confirm that the property is indeed sitting empty. That being the case, it would seem like an attractive redevelopment opportunity for the folks doing their thing a block away, wouldn't you agree? And it seems that the Greater Love people are on the same page. According to public record, University Court LLC purchased the property over the summer for a tidy sum of $400K. The 13K+ sqft building clearly needs a ton of work, but we fully expect to see the place turned into 12-16 student apartments over the next year or so. No permits have been pulled as of yet, so this is purely speculation, but it's certainly consistent with what we've seen in the area, and the architecture of a renovated building would be a refreshing change over the blander choices made for some of the new construction properties. Demolition could alternately be on the horizon, but what a shame it would be to lose such a handsome structure.